Now that my 2015 gifts are done I decided to do make myself a Christmas Skirt. Normally I wouldn’t dress Christmassy. At work I wear a Santa hat sometimes but it is very hot. Christmas day I throw on what ever is clean and wear that. This year when I received the December Sew Box I got some Christmas fabric that I didn’t know how I would use as I don’t decorate for Christmas but it was too nice to just give away, with a little thought I decided this might look nice as a skirt. I made the same A+ Skirt pattern that I made earlier this year (this is skirt number 4) I remembered to cut the fabric the right direction. The panels on the front don’t pattern match but I’m not worried, this isn’t the Great British Sewing Bee and Patrick isn’t going to judge it. I wear tops that cover the top panel anyway. 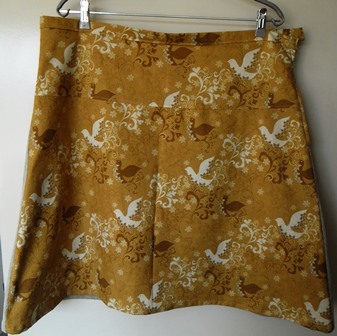 I didn’t have enough for the entire skirt so the back is another piece of fabric that I got in the June Sew Box. In air con I can wear corduroy in summer. Its only a small skirt so you don’t get too hot. Because they aren’t the same fabrics on both sides the skirt doesn’t drape like the other skirts I’ve made it looks more pointy at the bottom. It doesn’t stand out too much. I personally don’t care, the fabric isn’t green so I don’t look like a Christmas tree in it. I had to redo my side seam where the zipper sits as my first attempt wasn’t wide enough. My second attempt allowed me to put the zipper in easily and this ended up being one of my better zippers. I did have a little trouble as I must’ve cut the top panel too big and the waistline doesn’t match up on one side. It is a little bit higher. Now technically I should’ve trimmed it down but I noticed it too late. For something I’m only go to wear a handful of times a year and will be covered up anyway I’m not going to bother with. It zips and I placed the hook and eye closure in line so they close nicely that’s all that is important. I’m really proud of this skirt. 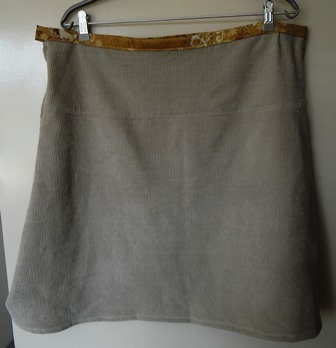 I thought outside the box (the sew box haha) and came up with a wearable skirt from fabric and supplies I had on hand. Even the zipper used in this skirt came from the December Sew Box. It was an 8″ and even though the pattern says to use a 7″ it still worked. It matches in with the colours too. I wanted to make the ladies in my sewing guild group a little Christmas gift. As I like practical items I decided a pin cushion was perfect. A sewer can never have too many pin cushions. This is a Tigerlily pattern that I got in the August Sew Box. It is designed to be a very basic pattern but the benefit of that is you can embellish it anyway you want. I decided to personalise them with each persons name. I used a letter font from the regular stitch patterns on my MC11000 I also did single satin stitch dot to make the controls of the sewing machine. The fabric I used came from the September Sew Box. These were a great gift to make in a batch. Adding each persons name only took a few minutes. 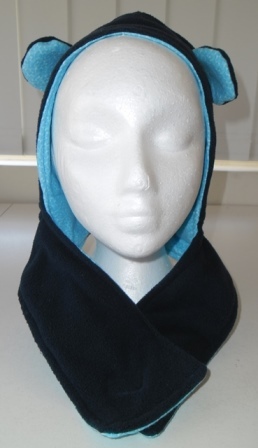 I have made another hooded scarf but this time I have made the Crossover version. The Wild Things hooded scarf by Big Little patterns comes with the ability to make the scarf in various versions. As this will be for an 18 month old I didn’t want a long scarf as I don’t want the little one to accidentally strangle themselves. The crossover version is perfect. The pattern also has a cowl version if you wanted it even shorter around the neck area. 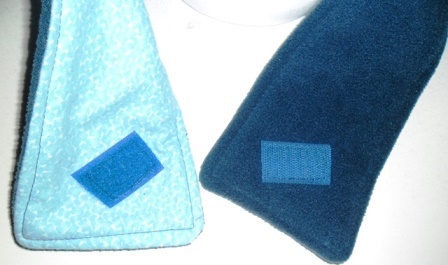 On this version a small amount of Velcro is use as a closure to hold the scarf in place. I have a stash of colour Velcro so was able to find a nice blue. Alternatively you could use a button closure. If you the fabric looks familiar it is because it is leftover from when I made my own scarf earlier this year. This is like a mini me. 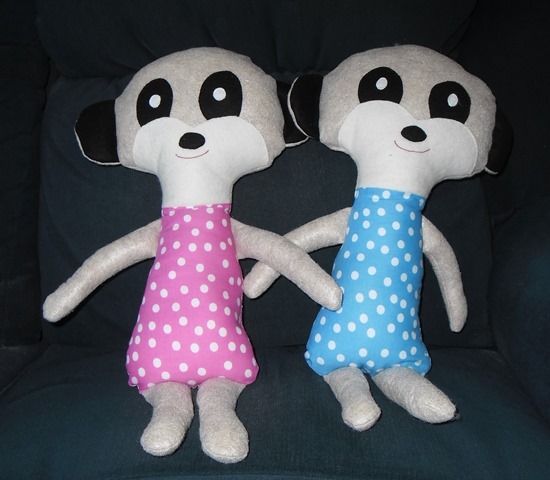 I have made a pair of sibling Meerkats for a pair of siblings this Christmas. Once again I used this Dolls and Daydreams pattern. Last year when I made it I used cottons but this year I used a mixture of cotton and felt fabric. 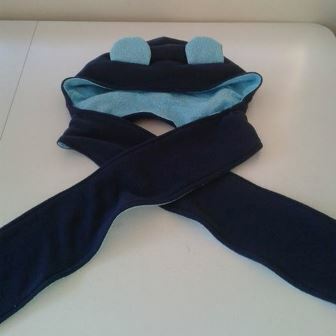 All his facial features, ears and limbs are done in wool felt with only the torso area in cotton. This was the first time I have really sewn with felt. 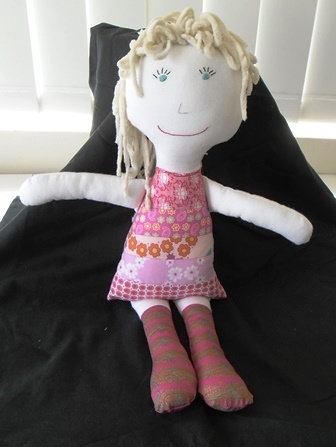 In the past I have only used felt on facial features or hair but I have never done limbs with it. It was thicker to sew through than regular cottons particularly when I was sewing the over all toy together, on the head you were going through multiple lays over the ears and muzzle areas. When it came to stuffing the limbs the felt held its shape really well, it was easy to stuff and ladder stitch the opening gaps closed. I’ll have to try stitching with felt again. I am really happy how these toys have turned out. They are a fun toy that you can make for any child no matter the gender. Same basic pattern but just by changing the torso you can make it for both a little girl and boy. I made these both at the same time and they didn’t take long at all. This time I did her a little different to when I made the other 2. Her dress this time is made from strips of fabric instead of squares. This is some of the fabric that I received in a Facebook scrap stash swap earlier this year. There were lots of pink shaded rectangles so I used them as strips to form both sides of the dress. 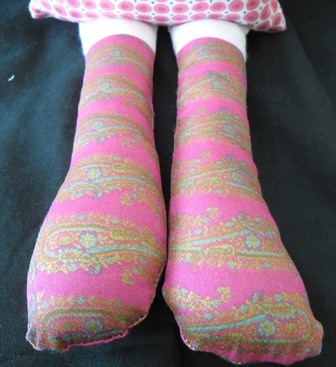 Her pink socks or “GoGo” boots as the pattern calls them are another piece of scrap fabric I had in my stash. 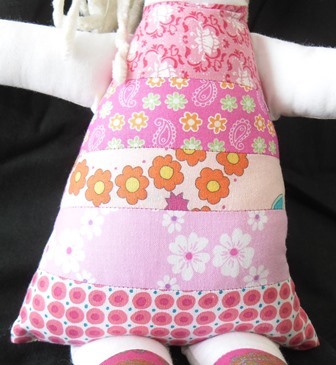 Previously I used the same fabric to make the body of Lollyfly and in Tooth Fairy pillows. In all projects the fabric was perfect for the situation. I love how this shows that fabric can be used for all different things and that you don’t have to limit yourself to only using fabric for one project or in one way. Originally this fabric was a boarder panel that I cut off a larger piece of fabric. 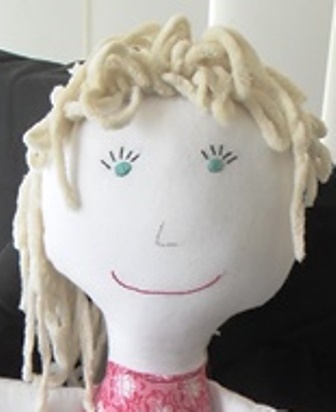 On her hair I used some chenille yarn. This made her hair a bit thicker and softer. I attempted a loopy fringe. I used the same technique as I did previously wrapping the yarn around an object (I used my cutting ruler this time) then sliding the yarn off and sewing it between freezer paper. Once it was stitched I removed the freezer paper and hand stitched the wig into place. I really like Scrappy Penny. She came from my scrap stash but looks so stylish. With a bit of thinking its amazing what you can do with your scraps. 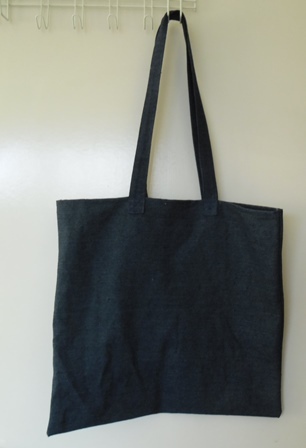 Whilst I had a jeans needle in my sewing machine from making the denim skirt I decided to make a tote bag from stretch denim I had cut out a few months ago. I needed a bag to replace my favourite tote bag which was beyond repair after nearly 10 years of use. The finished measurements are 16″W x 15″H Construction wise this bag is very simple as it is just rectangle piece of fabric folded in half. On the ends I did a double fold to hem the raw edges. Once folded in half I did the side seams on the overlocker (serger) The handles are a tube of fabric that I top stitched down the length both sides. They are attached to the outside of the bag. I did a lot of stitching to ensure they were anchored securely to the bag sewing in first a square shape than diagonally across both sides. I didn’t want anything fancy with this bag I just wanted a simple bag I could carry over my shoulder, was light enough to roll up to stick in my handbag or pocket but durable enough that I could stuff it with what ever I need. Hopefully this one will last me the next 10 years. 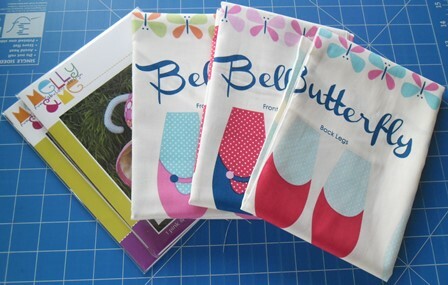 When I made the Bella Bugs I cut the pieces from a fabric panel. Each panel had a picture of the finished toy plus some other decorative detail which was too good to just toss in the bin so I decided to use them up. Scrappy shoulder bags were the idea I came up with. Each bag has the picture of Bella Bug on it. 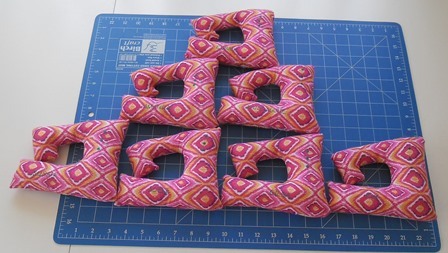 I folded over a seam around each piece and pinned it in place on the front of each bag which was a piece of cotton drill. I then hand appliqued around each square to secure it. So it wouldn’t just look like a scrap bit of fabric stuck on the front I decided to go machine applique around each one. I gave myself the challenge (I do love a challenge) my MC11000 has something 200+ stitches I decided I would use a different stitch on each side of the panel piece. I couldn’t use the same stitch twice even if it looked really pretty. I only had to find 16 different stitches. That’s not as easy as it sounds. I had to balance out the stitches on each piece so that they were different looking. 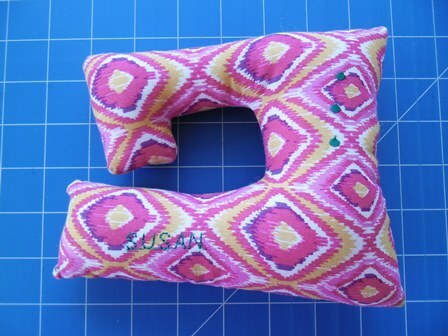 I didn’t want one to have all wavy stitches or have really dense stitches all the way around. It was a lot of fun having a play and a think. Some stitches look better than others but none look terrible. Each panel piece had 2 rows of butterflys on it. They were screaming to be bag straps. I stitched them right sides together before turning them out and top stitching along each side. 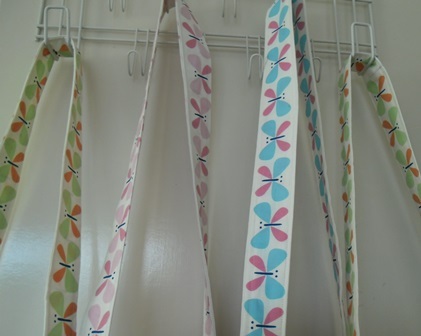 The outside of the strap is one long piece, the inside is 2 smaller pieces joined together. 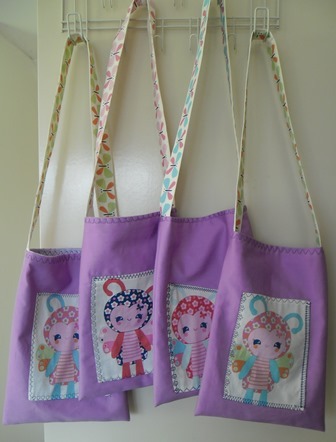 I didn’t put any interfacing in them as they are only kids bags. They hold their shape very well. For the inside I used some poly cotton that I had in my stash. I don’t usually use poly cotton but the colour of this worked well with the bags as I was going for purple tones. Also it was a way of using this fabric that otherwise would still be sitting in my stash. 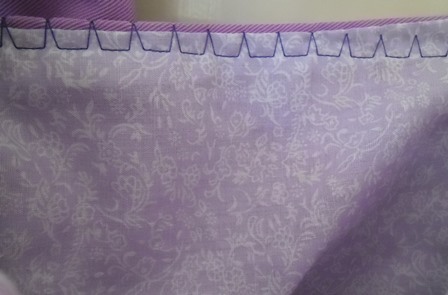 After I assembled the bag I top stitched around the edge with the same colour thread I did the applique in. Again this to me made the applique on the front tie in with the rest of the bag so not to make it look out of place. These turned out really well. Obviously I’ll match it up so the toys and the bag go to the same owner. These scraps were too pretty to let go to waste so I wanted to put them to good use. I particularly love the straps. Everything from these came from my scrap or fabric stash. They are a real Sew My Stash project.